Do you wish you could magically manifest an extra hour in your day? Is your schedule packed, but you wish you could help more people? ​Would you love more time to play, travel, and sleep while abundance continues to flow? 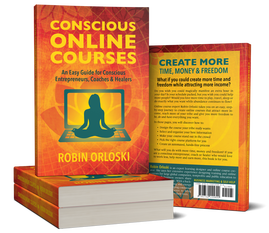 In Conscious Online Courses, online course expert Robin Orloski guides you on an easy, step-by-step journey to create online courses that attract more income, reach more of your tribe and give you more freedom to be, do and have everything you want. It takes time to create an online course. Use your time wisely to create a course that really appeals to your ideal clients. Solve their most pressing concern. Help them find a path to success. Learn how to create something special for your tribe that makes your heart sing. Select and organize your best information. You have so much important knowledge to share. Choose the "just right" amount to share with your students. Share too little and your students are unsuccessful. Share too much and your students are overwhelmed. Learn how to select and organize the perfect amount of content in the perfect way for your students to be the most successful. Create a course plan that will make this easy. You probably won't be able to clear your schedule and only work on your online course. With that in mind, you can maintain your flow by creating a detailed course plan. A course plan allows you to stop and start your project without losing valuable momentum. Learn how to create a course plan that is easy to pick up and follow whenever you have time to create. Make your course stand out from the crowd. You probably noticed how many online courses are being offered these days, right? You have unique gifts and talents and a unique approach to what you do. You want your perfect students to find you in a sea of online courses. Learn how to create a course that reflects your unique style and helps your students find their perfect teacher, you! Pick the right course platform for you. This is where people get confused the most. With so many course hosting options, including hosting it on your own website, it can be overwhelming to figure out which way to go. Learn how to narrow down your options and select the one that fits your situation the very best right now and into the future. Create an automated, hands-free process. If you really want more time, money and freedom, you will want to automate as much of this as possible. Signing up students, taking payment, delivering the content and even following up can be automated with the right tools. You may already be using some of the tools in your business that you can apply to your online course. Learn what you can do to free it up. What will you do with more time, money and freedom? ​work less, help more and earn more, this book is for you. Would you like to see a full list of topics covered in this book? Would you like to read a sample chapter?